The short range throw on this thing is insane! 150" picture from just 50cm! Well it looks impressive for the price considering Dell released the first 4K projector back in 2017 which still sells for £2500-3500.On the plus side you wont ever need to use the room lights again while your watching tv and it supposedly has a life span of roughly 13y dew to it's laser. There's also a 4k projector on offer. Pseudo 4k but my naked eye can't tell the difference.. bang on projector 4k on the cheap! Real 4k or pseudo 4k that are normally at this price? Great projector. Bought the px 747 from amazon for £480. Not voting but I would have expected more at that price than 100 lumen at 720p. Yeah I brought it for 550 on deal of day last year, your spot on I have sky Q box connected and also a now tv. Like you I was impressed with brightness and sharpness of the screen, only downside would be the sound would have loved to connect external speaker to it. Technically brilliant piece of kit - I am pleasantly surprised ! I already have 6-7 projectors that I use for various purposes. So here is brief overview of my review : Pro's Surprising bright crisp decent image for a portable projector. ( Even in daytime conditions - slightly draw one side of curtains) I can't believe this thing is only 100 Lumens brightness! Small, compact - unique design Very quiet - almost silent when being used and remains cool. Free wireless hdmi dock - included - play ps4 / xbox from anywhere in the house via wireless controllers Can project image from very short distance and onto any wall or floor( 20cm - 30cm) Decent sound / speaker built in - easily feels the room not tinny. Con's Requires two power adapters Can't wireless clone laptop / phone to projector unless its supports Miracast No Remote using bluetooth phone application Android app needs updating to include wireless streaming of youtube , netflix, prime etc via wifi connection Been a ultra short throw projector - any imperfections are very visible at close range ( sit further back ) Due to these restrictions - you will need the Hdmi dock connected most of the time, unless your device supports Miracast.. not a problem if your primary use is a games console or chromecast. This is a keeper!!! (which has shocked me - as i already own so many projectors) Bargain considering the original price of 1K - use sony online warranty checker to verify device has not been previously registered - so you have a full warranty. Don't know why it's going cold, tell me where you can get this cheaper? Never miss a 'Projector' deal again! Good projector have one although beware of mirror it’s easily scratched . No support from LG or amazon after 2 weeks mirror develop blurred poor quality plastic. Excellent price, I nearly got this one a couple of years ago for £1,000. Watched a few things on it, really good picture, 1000 lumens is not bad and you can place it on tv table and use it as a TV, only needs a few inches away from the wall for huge picture. Not a TV replacement, but not far off. Room needs to be quite dark, but not complete dark, just watchable during the day. Voted hot! 2 left, who else is going to grab one! Have had my optoma hd300x for around 6 years, typically watch 1 movie a week on it. Bulb is still going strong. Depends on usage. Most projectors automatically log the hours on the lamp so you can easily monitor it. There will also be manufactures guidelines on the lamp hours. Some can last over 7000 hrs on Eco mode. Very misleading comment. It has 8 million uniquely addressable pixels, as do all the DLP 4k shifters in this price range. It's not native 4k, but that costs 5 grand and it's very hard to tell the the difference with the naked eye, which I'm pretty sure is what you'll be using most of the time. Besides, there are other more important factors that determine the quality of the image than how it gets there. Am i right in thinking that all projectors need constant bulb replacements around 6months? We are looking for one of these for our wedding, to stream from a smartphone, can anyone recommend a good one? Thanks. Mpow Mini Projector 3000 Lumens Home Theater Projector £89.99 Sold by Mpow Retailer and Fulfilled by Amazon. I've got this one too. I never had a projector before and I was quite impressed with it. Claims 3200 lumens. In the mean time I've got an LG projector, 1000 lumens. The difference in between these 2 is huge, the 1000 lumens is a million times brighter and the quality of the image is incomparable. I bet the Crenova does not have more than 50 lumens. The only thing Crenova does bettert is it is shorter throw than my LG, so the image is bigger when projecting from shorter distance. 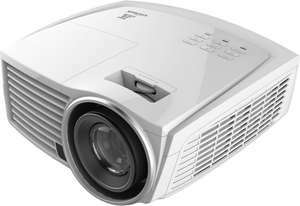 For £100 you can get much better projectors, probably better value to get a used well known brand, mine was about £500 new, I've paid £100 and only had about 50 hours of usage. The Crenova is in my kids bedroom, they watch cartoons in the dark, however we've paid £50 for it and when my wife wanted to return it, they gave her £30 back, so can't have high expectations for the price I've paid. Total barg for a 720p projector. I'd snap this up if I didn't already have one. plus i got an air mouse to use with mine, just plug the air mouse usb dongle into your pc, and then you can wave the air mouse with your hands to control the pc and netflix look for crenova or excelvan projectors for semi reliable,chinese makes, make sure the native resolution is a least 1280 by 720.
how does it compare to the optoma gt1080darbee.. Both are reasonable projectors. I prefer Epson with their 3LCD technology. It's only because of the rainbow effect that some of my family are sensitive to while using DLP projectors. I own the Epson 5650 model. I just had a look back at a deal I posted for the W1070 from Richer Sounds that I bought, Never realised It was that old and my 5 year warranty has just about finished, And I tried charging the glasses that I got free with it the other day as I never used them, And they don't seem to be holding a charge. Anyway, Back on point, If this is half as good as that has been, Bargain. As noted isn’t this a 2 year old projector? What’s with the pre release notice? You can get faux 4k projector for way less than £1k now. Dam this thing is chunky - avoid ! "Brightness: 100 ANSI lm / 500 lm; Resolution: 800 x 480 pixels; Projection Image Size: 30-95 inches" Will require a dark room, probably ok for occasional use.. outdoors / travel etc. Doesn’t look like anyone’s too keen on this here. Was wondering what this would be like purely for a small bedroom to project onto some blinds - instead of using the laptop on the bed all the time. I’ve got floor to ceiling windows a foot from the bed so a TV isn’t an option. 200 ANSI lumens isn't very bright at all. Also if you use it for gaming be prepared for a lot of motion blur and slow input lag. Is this really a bad deal? Why cold? But are there any 3d ones, this good, this cheap? 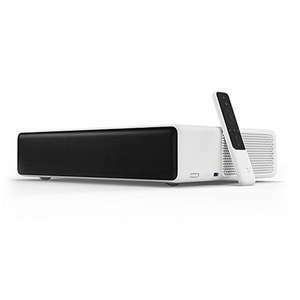 This is long throw projector ,you need minimum 3,5 meters to get 100 inches picture, you need long room &#x1F601;get short throw projector instead. It's tempting but the throw ratio calculator hurts my head - is there an easy way to determind how big the screen size will be depending on meters away from the screen? ie. 1m away 24 inch - 2m - 55 inch 3m - 65 inch etc. Seen this the other day, was seriously tempted, but I watched a review of it on Youtube and I noticed some quite bad rainbow effects, I decided I would go for this https://www.argos.co.uk/product/8033316 but on the Ebay store using the TECH10 discount code which brought it down to £360, I like the idea of 3D which this does not have, but in reality there is little good 3D content and with this being an LCD projector I will get no rainbow effects. Having said that, for £296 you can't go wrong for this price getting a 1080p projector so definitely still a good deal. If you're eager to stream and watch your favourite DVDs and online media on something bigger than your TV screen, you'll find plenty to like about the Full HD image quality and 3D capabilities of home projectors. Likewise, if you're a business owner or office administrator looking to make a greater impression during business meetings and seminars, a business projector with straightforward setup and seamless control can be an ideal solution. This buyer's guide to choosing a projector describes the development and technical specifications of projectors in addition to the different types of projectors available today. This information is complemented with a comparison of display technologies and projector screen options to help you decide on the best projector to suit your needs. Projector applications and accessories complete the guide, ending with an overview of buying a projector online. Differentiating themselves from slide projectors and movie projectors that project images from film rotating at constant speeds, modern day digital video projectors communicate with connected digital devices to cast received video signals onto a projection screen. Since their development in the late twentieth century, video projectors have evolved from the old, bulky cathode ray tube system to much more portable models; equipped with liquid crystal displays for home, office, and classroom use, to handheld pico projectors with digital light-processing technology, long-lasting LED bulbs and support for wireless connectivity and 3D video. Home Theatre Projectors – Home theatre projectors are designed to work in rooms where lighting can be controlled; perfect for family movie time if you're lucky enough to have a dedicated media room. If you're more of a gaming buff, extra HDMI connectivity options in home theatre projectors mean there's space to plug in your games console. Thanks to their support for intense film and game entertainment, modern home theatre projectors are also rated to handle 3D-enabled content. A home theatre projector with higher brightness levels work better for rooms with sources of natural light. This means putting one up in a games room or man cave when friends come round on game day, or slotting in your SD card or flash drive and showing off your latest holiday snaps on a quiet Sunday afternoon. 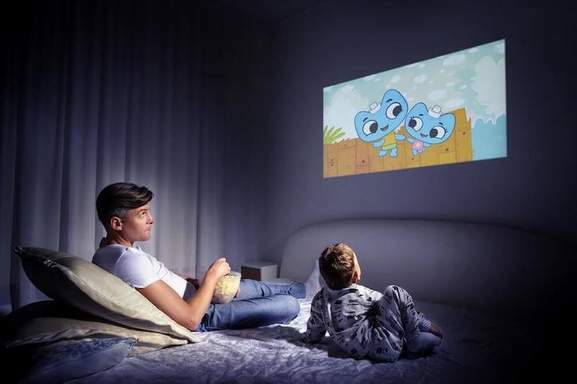 Manufacturers of home theatre projectors look set to push further into smart technology as more and more people are watching TV and listening to music online. That means more projectors in the future will be able to connect to your home router and stream content wirelessly from your computer or via an app on an iOS/Android device. Business Projectors – Business projects differentiate themselves from their home-theatre counterparts in both functional application and technical specification. Business projectors boast higher brightness levels to ensure that colours stay vibrant and black text doesn't look faded from the ambient glow radiating from ceiling lights. This means looking for a projector with a high ANSI lumen count of at least 3,000. Since business projectors must offer the versatility to perform in training and classroom environments, small to large presentation halls, and office meeting rooms, they normally include zoom functions, horizontal and vertical lens shift. They also require an abundant connectivity option that works seamlessly with VGA devices, USB flash drives, SD cards, component video and S-video cables, HDMI inputs, and DVI systems; all designed to offer quick and simple set up. 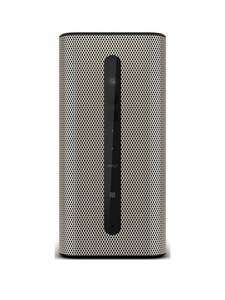 Any built-in audio may work for small spaces but additional speaker ports typically come as standard, with integrated wireless support a feature on higher end models. Pocket-Sized Pico Projectors – Handheld pico projectors represent the latest in mobile media and group entertainment. Advanced models are powered by a rechargeable battery, include a built-in speaker, can be controlled from your smartphone or tablet computer, and can project streamed media and still images up to around 65 inches. Their small size is tied to their ultra light weight that means you can comfortably fit a pico projector in your pocket or bag and enjoy movie night on a weekend camping trip, then give a slideshow of your trip at a friend's house the next day. 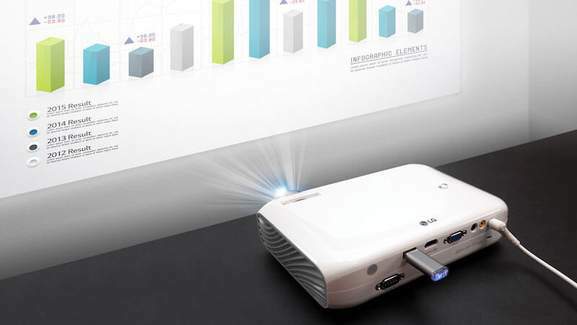 Business people on the move also rely on pico projectors every day. After all, those travelling sales staff and managers need to deliver persuasive presentations in a practical package, ideally without adding heft to their baggage. Within the set of home theatre, business, and pico projectors is a subset of display technologies, namely digital light processing (DLP), liquid crystal display (LCD), and liquid crystal on silicone (LCoS). There's a lot of discussion regarding the best display technology in projectors, with a seemingly balanced set of benefits and drawbacks for each type. DLP – DLP makes use of light reflections bouncing off tiny mirrors and onto or away from the screen, with a rapidly spinning colour wheel and colour filters allowing projectors with DLP to generate sequential colour. Top quality DLP projectors, including those found in movie cinemas, boast individual blue, red and green DLP colour chips to enhance colour representation and sharpen picture quality. The lightweight, low profile benefits of DLP chips make them perfect for use in small, portable pico projectors, while smoother image quality during fast motion, better colour contrast and a deeper range of blacks give DLP the edge over LCD in the movie playback stakes. Due to the way most DLP models create colour via a spinning wheel, however, you may be distracted by a constant flickering on the screen. The other downside of DLP is the high cost for a three-chip model, which can cost thousands compared to the hundreds you'll pay for an entry-level, one-chip model. LCD – LCD makes use of three individual blue, red and green liquid crystal display chips that each control the amount of light passing through their shutters to generate their own image on the screen. The final result that you see on the screen is the combination of images from all three primary colours. The advantages of LCD projectors include their production of much more vibrant colours in ambient light thanks to their increased brightness, sharper 3D image rendering and greater energy efficiency over DLP. As a result, LCD displays are often found in business projectors. The only real downside to LCD technology is when the number of dead pixels increases over time; a common problem affecting LCD TVs and computer screens. LCD projectors cost about the same as DLP models in their class but often providing extras like lens zoom and lens shift in models at the same price point. LCoS – LCoS employs the best of both worlds, combining tiny mirrors and liquid crystal chips to reflect and block light when creating the final image. They also place pixels closer together to reduce the effect of dead pixels on your viewing experience. As a result, LCoS projector manufacturers can offer brighter display, superior colour saturation, and much smoother video. Accordingly, LCoS projectors are the most expensive of the three display technologies, ranging in price from over a thousand to tens of thousands. Typical technical specifications of projectors include light sources, brightness, contrast ratio, resolution, throw distance, lens zoom, keystone correction and lens shift. Let's take a closer look at each of these specs below and find out which factors will determine your projector choice. Light Sources – There are three kinds of light sources that can be used in projectors today, each with their own advantages and disadvantages for their use. Standard lamps are the most common and cheapest option. Standard lamp projectors offer bright image output but you may notice the bulbs begin to dim as they age. The typical expected life of the bulb estimated at around 3,000 to 4,000 hours before they need to be replaced. If you're concerned about environmental impact, note that projector lamp manufacturers are still producing hard-to-dispose mercury-containing lamps that may also emit mercury vapours during operation and if the bulb is unplugged before it's had a chance to cool down. Standard Bulb – Of the three light sources, a standard bulb consumes the most power and therefore is the most expensive to run. You can offset this energy usage by turning off the lights while watching movies and during presentations. Plus, you won’t be using a projector all the time, so you shouldn't notice much of the impact of using a projector on your utility bill costs. LED – LED (light-emitting diode) bulbs, on the other hand, are mercury-free, more energy-efficient, produce less heat and noise during operation and boast superior colour management to that of standard lamps. LED bulbs have an expected lamp life of around 30,000 hours, but this can be higher or lower depending on bulb quality and manufacturer. This means that although they cost more, you'll replace them less often, which makes up for the additional cost of using LED bulbs. On the downside, LED lights can't compete with standard lamps in terms of brightness. Laser – Laser projectors are ideal if you're tired of shelling out for replacement bulbs. The energy-efficient RGB laser light further reduces running costs and using a laser projector at home or in the office ensures stunning picture quality. In fact, the constant brightness, superior contrast and wider colour range make laser projectors an attractive option for cinema use and other large venue or outdoor projection applications. Laser projectors are the most expensive to buy due to the high cost of sourcing and developing powerful yet harmless laser technology. LED/Laser-Hybrid – Hybrid LED/laser projectors represent the most exciting advancement in the future of projectors. They bring the best of LED and laser technology to produce optimal picture quality and longer lifespan without the mercury and energy usage of standard bulbs. As more projector manufacturers continue to invest in developing next-generation hybrid models, the price should push down well below that of a laser projector of equal spec. Brightness – Brightness is one of the most important aspects to look for when buying a projector. Measured in ANSI lumens, white brightness levels indicate how bright and clear the display will look at certain distances, while colour brightness levels indicate how vivid and detailed the colours will be at certain distances. The comparison between the two brightness measurements can tell you how the projector will deal with colour depth and image clarity. Home theatre projectors range between 2000 and 2500 ANSI lumens for both white and colour brightness, ideal for dark and dimly-lit rooms. Business projectors offer a higher white and colour brightness lumen rating to cope with well-lit office environments. Contrast Ratio – The ratio of the luminance between the brightest colour and darkest colour the projector is able to produce is known as the contrast ratio. A projector with a 10,000:1 contrast ratio, for example, displays the whitest areas of an image 10,000 times brighter than the blackest areas and therefore lets you see evening and daylight scenes in movies better than a projector with a 3,000:1 contrast ratio. Like most TVs, the levels of natural light flooding into a room and the amount of light within the room will affect contrast. Though not considered as important as brightness, the contrast ratio can affect the viewing experience when watching movies in a dark home theatre room and help you distinguish subtle differences in shade in a well-lit classroom or office. Resolution – Resolution means everything in the world of display technology. 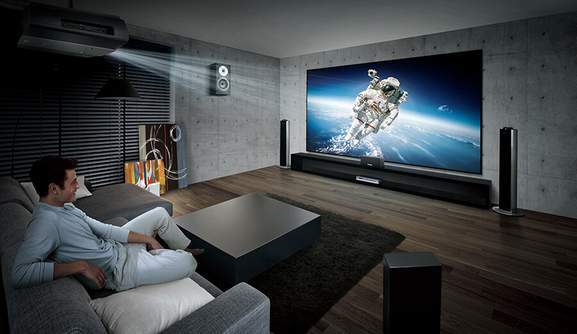 Just like TVs, computers, and touchscreen devices, projectors come in a variety of resolutions from the respectable 480p to the more commonly-accepted Full HD 1080p and to the next-generation 4K Ultra HD models. A higher resolution means a greater number of pixels can fit in the display and produce a noticeably crisper viewing experience. However, projector resolution works best in alignment with the device it's connected to. For example, you'll get a better picture if you link your DVD player to a Full HD 1080p projector (standard 4:3 and widescreen 16:9 aspect ratios), your Blu-ray player to a 4K Ultra HD projector (widescreen 16:9 aspect ratio), and your laptop to a business projector designed to project SVGA images at 800 x 600 pixels, XGA images at 1024 x 768 pixels, and SXGA+ images at 1400 x 1050 pixels. Throw Distance – The throw distance describes how far the projector will cast the image and is a significant specification to take into account if you want to mount your projector because it's directly linked to the size of your screen and distance from the projector. Projectors come in short to long throw versions to suit your set up. Not mounting the projector means you can move it closer or further from the screen to yield a full-width image regardless of the projector's throw ratio. However, using a short throw projector far from the screen will make the image look too small in relation to the screen, while a long throw projector close to the screen will overlap the screen edges. Knowing how to calculate the throw distance will help you determine which model you need. And if you already have a projector, the throw ratio in the product specifications, usually given in a range to take lens zoom into account, can help you figure out the best screen width or distance. For example, you have a screen that's 3m wide and the projector has to be securely mounted on the back wall 10.5m away from the screen. The distance divided by screen width means you would need a projector with a throw ratio of 3.5:1. In another example, say you already have a projector that has a throw ratio of 2.0:1 and your screen width is 2m, then you would mount your projector 4m from the screen for maximum image quality. Lens Shift and Keystone Correction – Lens shift is a mechanical option built into advanced home projectors that lets you make adjustments to the lens angle and fix any distortions in the display; for example, when the image doesn't line up neatly on the screen and you can't access the projector to move it physically. Keystone correction performs a similar function but does so digitally, making it more suited for portable projectors that you will use of lots of different screens. As a result of this digital adjustment, however, keystone correction can negatively affect the display resolution. Lens Zoom – Like lens shift and keystone correction, projectors that aren't permanently mounted and need to be used in various rooms will likely require size adjustments to fit on each screen. At times when moving the device to fill the screen proves too cumbersome or simply can't be done, projectors with lens zoom capabilities let you fine tune the display size. You will note, though, that image brightness suffers as you zoom in more. After paying for a quality projector, the last thing you want to do is skimp on the screen, or worse still, watching movies on a white wall. Quality projector screens feature image reflection attributes to ensure colours look vibrant, 3D images are rendered properly, any shadows and ambient light are reduced and text and graphs appear bright. Projector screens also come in various types. The most common types are fixed screens that you'll use in combination with a mounted projector in your home theatre, pull-down screens that are perfect for classroom and training environments where you need access to a whiteboard behind the screen, portable screens that act in the same manner as pull-down versions but with the benefit of portability and motorised screens that lower into place and stow away at the push of a button. 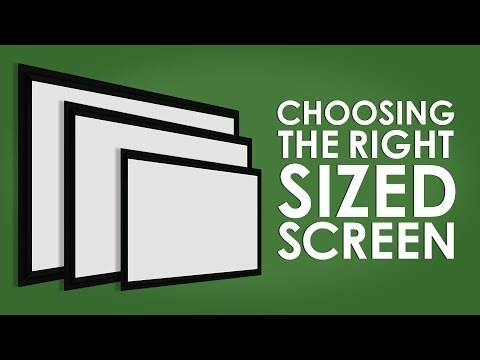 The projector screen size should align with your projector's aspect ratio. The most common aspect ratios are standard 4:3, widescreen 16:9, and cinemascope 2.4:1. And like TV screens, projector screen sizes are measured diagonally in inches from corner to corner, with consumer screens ranging upwards of 300 inches. As mentioned previously, the size of your screen will be determined by the throw distance calculation but you'll also want to consider the size of the area where you'll install the screen. Some accessories for your projector are just as important as the projector itself. Audio and visual options help enhance the content experience for home and office use, while a universal remote lets you control operation of mounted projectors in hard-to-reach places and manage sound levels of an external speaker system. Projectors can be placed on a table for easy storage and access when you need it, but any connected cables during operation can be a trip hazard; particularly if you're using one in your classroom with kids walking around. A projector mount on the ceiling or back of the room secures the device in the most visually optimal location and well out of arm's reach. Because projectors are designed for mass viewing in large spaces, everyone in the audience may perceive sound at different levels, depending on where they are sitting in relation to the projector's built-in speaker. Whether running a conference or watching a movie, a surround sound speaker system hooked up to your projector will deliver sound at uniform volume levels around the entire room. 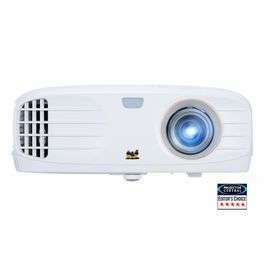 Several big merchants are offering a wide range of projectors made by Casio, Philips, Epson, Optoma, and other major manufacturers. With sites like Amazon, Currys, Richer Sounds and Box.co.uk creating competition in the market, you can find great bundle deals at any time of year. If you're not forced to make the buy at a certain period, wait until the Black Friday, Cyber Monday and Christmas time in November/December is coming up. Traditionally, especially electronics is reduced at that time of year. If you're convinced that a projector is right for you and are looking for a good buy, HotUKDeals has a unique projector tag page that will keep you up to date about the best deals for projectors online.